Hipster Sanctuary salutes Carl Anthony , Entertainment Expert and Jazz Host/Hipster. Over the Years Anthony has touched on all aspects of entertainment, from productions to promotions, thus laying the groundwork for his next passion, Jazz Radio. At the very Dawn of the 1980s, Carl ventured into a small radio station in upstate New York and honed his craft, building his loyal fan base along the way. Moving to Atlanta some years later, he spent the last 24 years at Atlanta/Clark University radio station WCLK FM . Carl was a jazz voice in Atlanta and around the world via the internet as host of“Serenade To The City” on Atlanta’s #1 jazz station Jazz 91.9FM WCLK. During his tenure, his most notable achievements were the creation and voicing the weekly jazz calendar, “Atlanta’s Live Jazz” for seven years; served as Master of Ceremonies for the Atlanta Youth Jazz Band Competition from 2003 to 2013; has produced jazz shows and fundraisers; and has hosted jazz concerts on every major stage in Atlanta. He has interviewed countless musicians, actors and authors and has been invited to be both panelist and host of numerous panel discussions. Carl facilitated “Jazz In The Classroom” programs at various middle schools in the metropolitan Atlanta area; annually volunteers for career days with middle school children; and continually mentors college students. He conducted jazz workshops at the 2009 National Black Arts Festival, for whom he also hosts a weekly jazz program, Notorious Jazz. 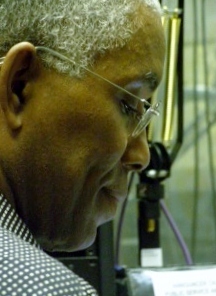 You can also enjoy Carl Anthony ‘s great postings around the internet groups and podcasts entitled “Daily Dose of Jazz” which you can visit him at http://notoriousjazz.com for your medicine. Carl volunteered his time and knowledge from 1991-2012 with the Atlanta Black Rodeo Association producing rodeos and instilling children with the confidence to connect, ride and care for horses. He has been inducted into the Who’s Who In Black Atlanta for his contributions to the jazz and film industries at Jazz 91.9 FM WCLK and A Gypsy Life Productions. As curator at Notorious Jazz, Carl Anthony continues to preserve the genius that defy popular taste for original design. Next Post Bernard Linnette Quartet Presents! !